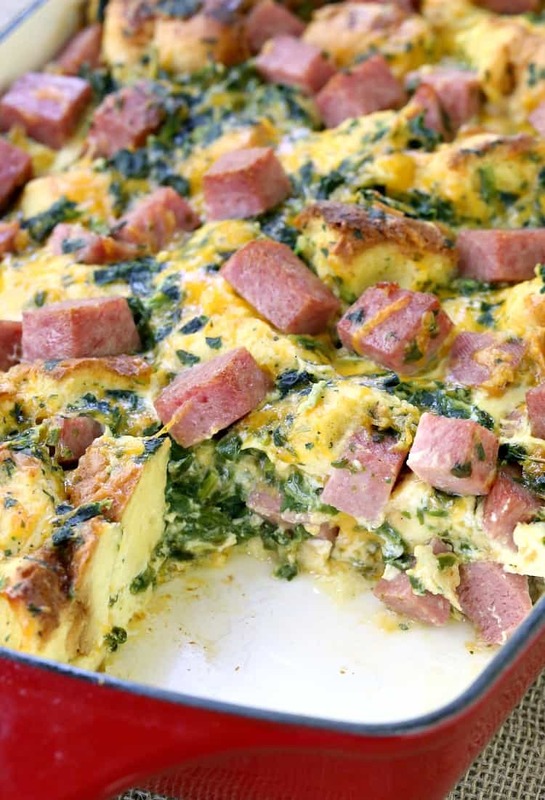 This Taylor Ham Egg and Cheese Breakfast Casserole is the perfect brunch dish! 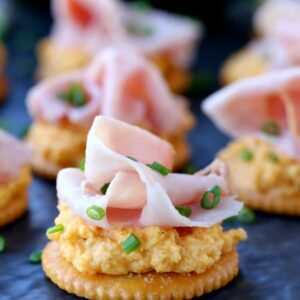 If you’ve never tried taylor ham before, now is the time! Christie just had a friend visit from her hometown of Chicago, a friend that she’s had since kindergarten if you can believe that. They lost touch for a few years just because of life getting in the way, no other reason at all but they made it work for a weekend a couple of months ago and I have to say, it was a fun time had by all. We went back and forth on what to do but they just kept saying that they would figure it out – play the weekend by ear. I think they knew that all they needed to do was sit down with a few bottles of wine and just start catching up. The talking really didn’t stop I have to tell you. Neither did the drinking. Now you’d think we’d want to impress our guests and make something really nice like this Creamy Tuscan Spaghetti with Jumbo Scallops…Nah. We ordered pizza. Well, for the first night anyway. Man, we had a house party like you wouldn’t believe. Just a few of us but it was so much fun. Listening to all their stories about growing up was pretty funny, listening to the sing out loud to some of their old favorite songs…even better. I ended the night with some signature shots of course, Duck Farts were the first thing on the drink menu! Don’t know what that is? Click on over for the tastiest shot ever. So the next day was a little lore low key if you know what I mean. Took a drive to a nice neighborhood by the lake for lunch and went home to relax for the afternoon until dinner that night. 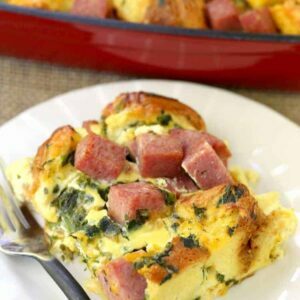 This Taylor Ham Egg and Cheese Breakfast Casserole is also perfect for those days or mornings that you just can’t get it together but you know you need to. You know what I’m talking about…a little too much indulging the night before maybe? 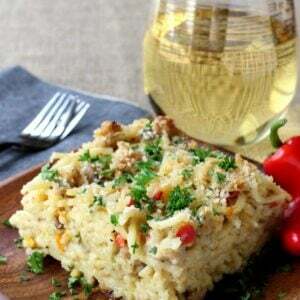 All you need to do here is toss all the ingredients together and get it in a baking dish. 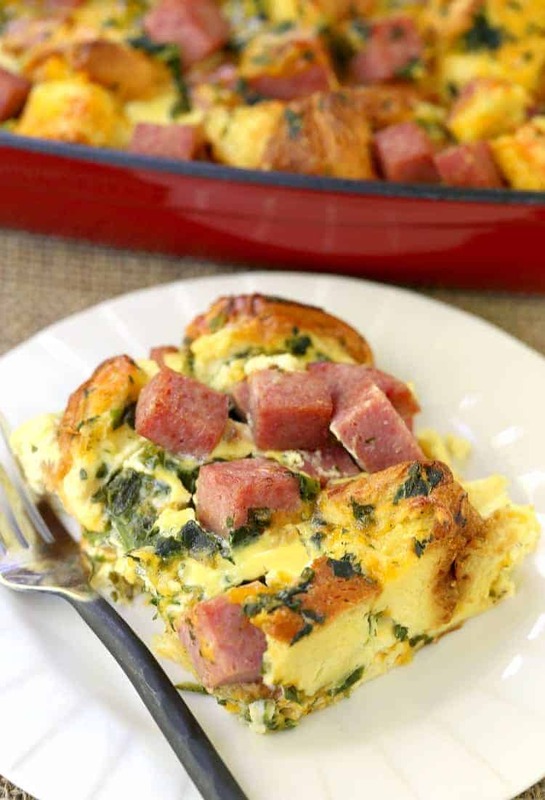 You can pop this overnight breakfast casserole in the refrigerator for the next morning or put it right into the oven. I’m giving you options here. Instead of making this breakfast casserole, that I hadn’t thought of yet…the next morning I offered to run out and get breakfast sandwiches, you know how you need some grease to soak it all up and all that. Christie said she wanted a taylor ham egg and cheese. Being from the midwest, her friend had no idea what taylor ham was, so I set out to show her exactly what she was missing! She tried some and of course loved it, I knew she would. And then the boys came along and my little guy couldn’t stop eating it off Christie’s sandwich. Why don’t we buy this? he said. Well, it’s not the healthiest thing in the world but I guess we could get some once in a while? So buy some, we did. It was the biggest taylor ham we could find. 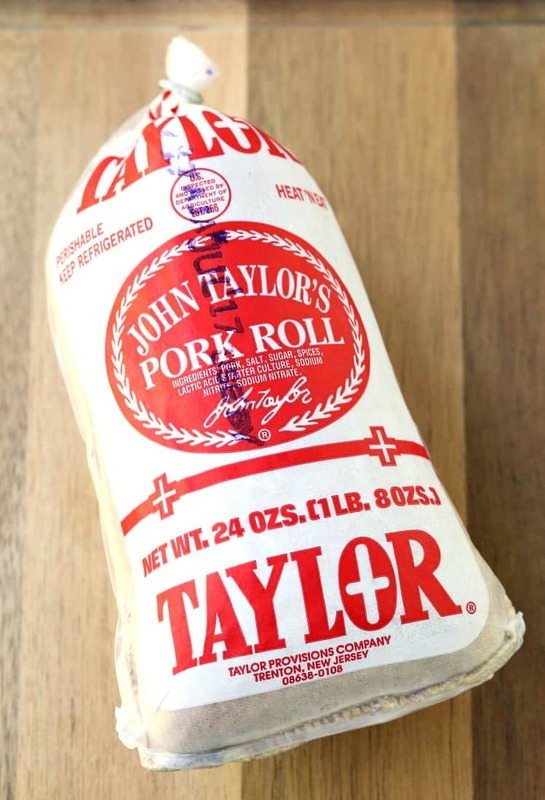 Taylor ham, or more commonly known as pork roll is a pork based, processed meat. Sounds yummy huh? 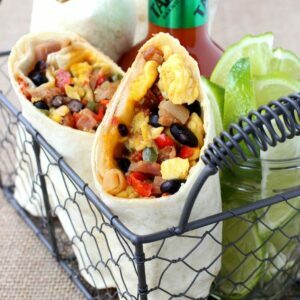 Trust me, it’s one of the most yummy things you’ll eat… keep reading. The flavor is a crsoo between candian bacon, bacon and ham. All the good stuff combined into one package. So if you’re from New Jersey, a common late night diner order would be a taylor ham, egg and cheese on a roll. 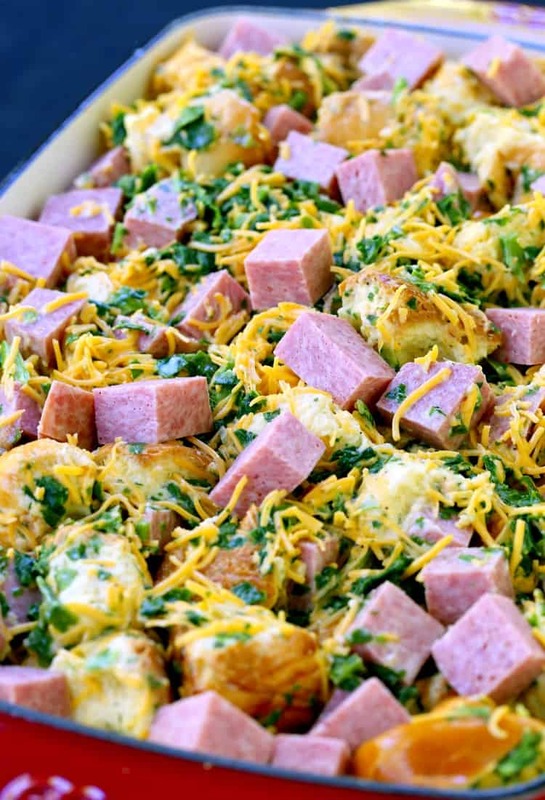 Oh yes, I had plenty of those nights…thinking back is when I had the idea of taking the taylor ham, egg and cheese sandwich and turning it into a breakfast casserole. Sort of like serving the famous breakfast sandwich to a whole crowd. 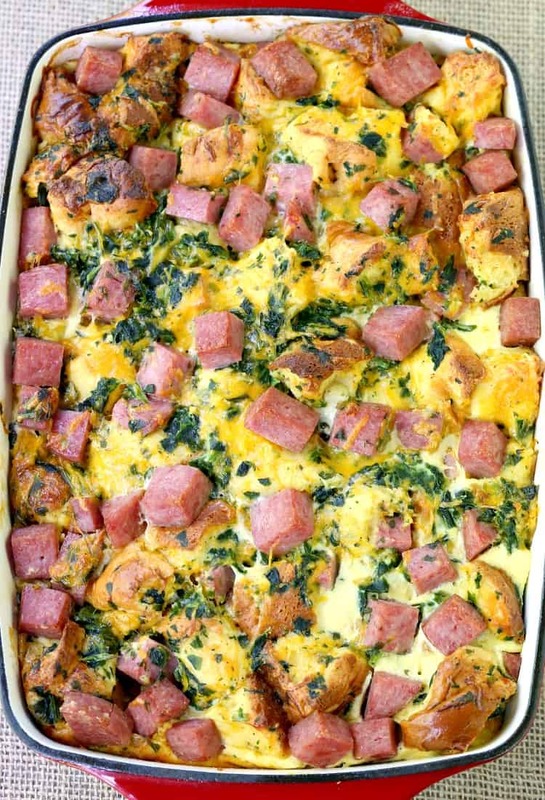 You can make this This Taylor Ham Egg and Cheese Breakfast Casserole ahead of time, in fact it even tastes better if you do, so it’s perfect for brunch or entertaining when guests are over for the weekend. And who doesn’t love a good cheesy, salty breakfast casserole? Especially after a night of belting out Wham Rap in your kitchen until 1 AM. Oh yes, that’s a thing guys. Google it. Butter a 9″ x 13″ baking dish. 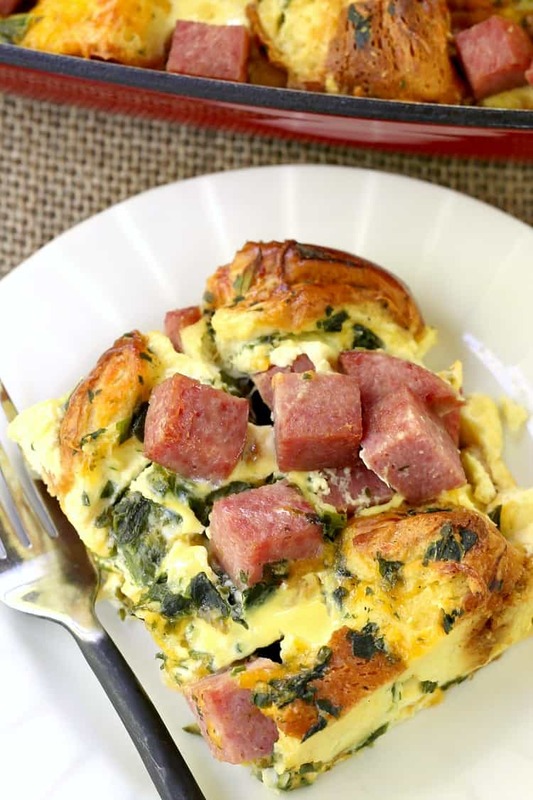 Add the bread, ham, cheese, spinach, salt and pepper to a large bowl. Beat the eggs together with the milk and butter then pour over the bread mixture. Toss together gently to coat all the ingredients then pour into the buttered baking dish. Cover and refrigerate overnight or at least 2 hours. Bake the casserole at 375 degrees for 45 minutes, covered. You can uncover the casserole and bake another 15 minutes if you want the top to brown.